You'll be £15.00 closer to your next £10.00 credit when you purchase Great Western, Eight Coupled Heavy Freight Locomotives. What's this? 'Great Western Eight-Coupled Heavy Freight Locomotives' is the first of a series of 'Locomotive Profiles' to be published by Pen & Sword. It will describe the conception, design, building and operation of the fleet of powerful locomotives built in the first half of the twentieth century to meet the demands of the growing South Wales coal and steel industries and the West Midlands area served by the Great Western Railway. Whilst concentrating mainly on the standard designs of the great locomotive engineer, George Jackson Churchward, the 28XX and 47XX 2-8-0 locomotives, it will also cover the 2-8-0 and 2-8-2 tank engines designed for the South Wales Valleys mining areas and coal exports through Newport, Cardiff, Barry and Swansea Docks, and other 2-8-0 locomotives acquired by the Great Western to cope with the increased industrial needs during both world wars - the RODs, Swindon built 8Fs, WDs and American S160s. It will also cover the earliest designs of the Barry and Port Talbot Railways intended to cope with the valley coal traffic. The book will be copiously illustrated with 150 black and white and 50 coloured photographs and is a comprehensive record of some outstanding freight locomotives, many of the oldest engines still operating to the end of steam on British Railways in the mid 1960s, sixty years after they were designed." A very interesting book on a capital issue within the British railway industry. on the Great Western G. J. Churchward designed a standard 2-8-0 heavy freight locomotive. Rolled out in 1903, the class lasted to the 1960s. With standard boilers and other parts he then designed a 2-8-0 tank engine serving mostly in South Wales on coal traffic. These are well described by David Maidment who clearly knew the engines well and is giving royalties to the Railway Children charity. The book is full of beautiful photographs, both black and white and colour, and these provide a wealth of invaluable information for railway modellers, model engineers, full size restorers as well as historians and the arm chair enthusiast. Our 4709 project has been intimately involved with a 52xx and 28xx which were ‘donor’ engines for our 4709 engine and we have found this book a valuable source of information from both the photos as well as the text information. David was also the creator and chairman of the ‘Railway Children’ Charity and all advances and royalties from this book are being donated to that truly wonderful and inspiring cause. 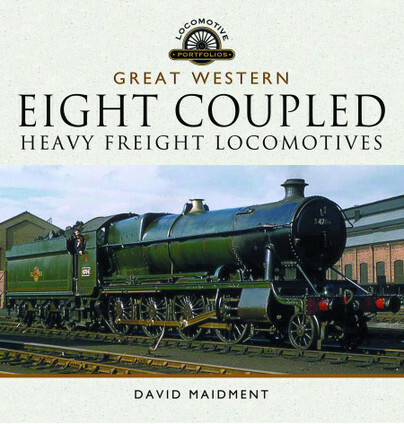 I can whole heartedly recommend this book to everyone interested in the Great Western and in particular how they were so successful and effective at the movement of freight. A nice touch, where relevant, are personal accounts of the locomotives from David Maidment and crews, which brings life and colour to what could very easily have been a dry technical history. Production values are clearly very high for this informative, well written and exquisitely illustrated book. It has set a very high bar for the rest of the series. It's the astonishing variety and quality of the photographs that really makes an impression. the selection from all periods is superb, with many rarities in colour too. This is a thorough study of the GWR's heavy freight engines which concludes with a technical section of diagrams and weights for each class.